A great value hard wearing long handled dustpan and brush. The dustpan has a self-closing lid so stops rubbish being blown about if used outside.The dustpan also has an easy grip handle on the back of the dustpan for easy disposal of waste.A main feature to this dustpan which others don’t offer, is the wheels on the base of the dustpan. 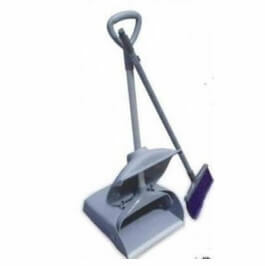 Two small wheels allow this dustpan to be easily and effectively moved from area to area for cleaning. Great if you are covering large area’s and stops the bottom of the pan wearing away..
PO Box : 118905 , Dubai, UAE.